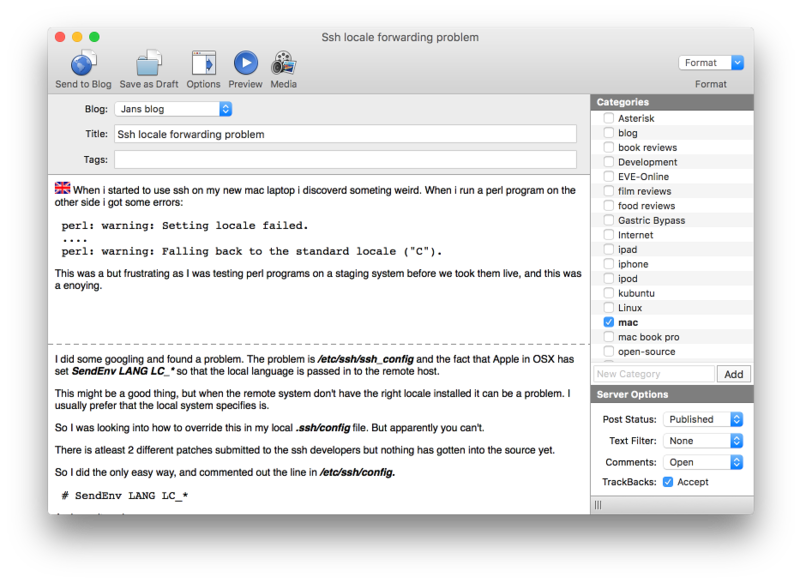 Blogging on mac, hard question?When I started working on my mac I did not foresee that I needed to blog on the mac. I was quite happy with my blogger app on my iPhone/iPad for doing that work. But more and more I wanted some app on the mac. First I tried the WordPress app. 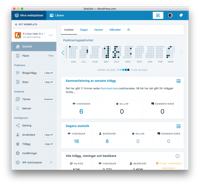 It’s not to bad – the app is made by the same people that does the WordPress blogging software and if you only going to use WordPress as a blogging platform it might be an alternative. And its free!! But then the problems start. It doesn’t seems to handle my drafts right. I get multiple copies of the same draft. Or drafts show up as published edits. Very weird. On the plus size it gives some nice features and stats about you blog, and it’s using the jetpack from WordPress to do this. Is you want to test it its available at https://desktop.wordpress.com/. Next on the list was MarsEdit that a lot of people is talking very well about. It has a nice interface – al lot of features. One thing is a bit strange and that is that it has the first part, and then the “Read more” part as a fixed line. But I guess you can get used to that. The big problem with MarsEdit that I found is that it can do thumbnail. If you add an image it will insert it into the blog as it should, but if you scale it its still the full picture. But besides that it seems a full and nice program. It has one thing I really like, and that is you can see the HTML code behind the post, so you can switch between Rich Text editing and HTML codes. Even if it’s a bit pricy, you can get a 30 days trial at https://www.red-sweater.com/marsedit/. First I tried blogo even before I tried marsedit, but had a problem with my images. As you can see I always start my blogs with a small flagg showing if it’s an english or Swedish blog entry, but I was a bit putoff when it did not show the images, and also placed it in the wrong place. But after trying the other blogging tools I went back to Blogo, and did some more reading on the web. Apparently you don’t have the pictures showing in the editor unless you hover over it, and if you click on an image you can edit adjustment and so on. This was the old (Version 2 app) and they have now released a new version – Version 3. And it is even better. In now shows thumbnails of pictures (you can convert to old way in settings if you want). And it will make thumbnails and full images on the fly. It was a fairly expensive app, but now they changed the licence from a paid app to an upgrade to pro system. The pro system adds possibility to sync to more than one blog, monitoring your comments, sync with Evernote and more. It’s now free and you can test it without paying for the pro version – https://getblogo.com/. But as and old user that had the app before the change I get the pro version for free for 3 years, and I would gladly pay the fee for the pro version. 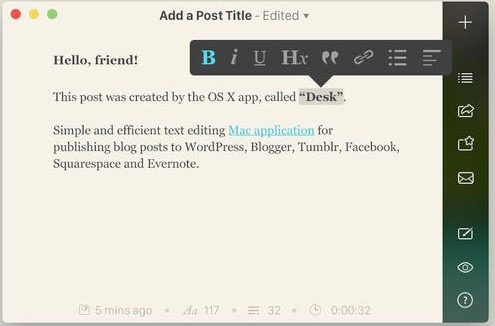 The other app I found for blogging was ecto. The good thing about this one was that it had the feature I mostly liked on my iPad is that the bloggo app that I’m using there has both html editing and RichText editing, and I’m kind of used to this. But when I started to use it and tried to edit a post that I was working on (this one in fact) I got some errors when it tried to read in the post, and it also did not import the post. So this one is off my list. If you like to test it you can download a trial on http://illuminex.com/ecto/. When I now tries to go back to the download link it seems to be offline so it might be totally off the market now. This is another app that seems promising, but they refuse to make a trial version. And with a price of over 20 GBP I’m not that interested in shelling out that much money just to be able to test it. It seems to have a nice and clean interface, but you cant find much info on the net of how it work. It seems to have more options for other blogging sites than Blogo, but as the interface if very similar to Blogo and you can test Blogo for free I’m going with that. I now using the Blogo app and after the latest updates, it a dam good app. I have even switched from my old app on my iPad to blogo even there as this gives me the same app on both the mac and the iPad. This entry was posted in blog, mac, osx, Personal. Bookmark the permalink.